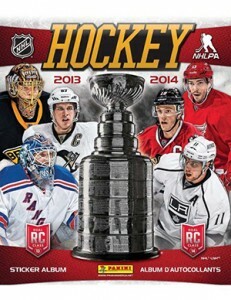 Cheap and easy to collect, 2013-14 Panini NHL Stickers feature a large set that captures the best that each of the league's teams have to offer. Collectors can also expect the top 2012-13 rookies to have their rookie stickers. The complete collection has a total of 356 stickers. Most of them are basic glossy stickers -- 296 to be exact. They are joined by 60 foil stickers, the closest thing the release has to inserts. As with other Panini sticker collections, a color album can be used to house the set. This one clocks in at 72 pages. 2013-14 Panini NHL Stickers boxes come with 50 packs on seven stickers. There is also a combo box that comes with 100 packs and 2o albums. Each sticker pack also has a digital code. Details on what these codes can be used for is not yet available. 2013-14 Sereal (no Panini) KHL 6 season. Full set stickers+empty album+pack. 328 cards. Foil cards are short prints.